Tucked into a cobble-stoned corner of Liberty Square is the quaint refreshment counter Sleepy Hollow, providing a beautiful profile view of Cinderella’s Castle and delicious snacks. Sleepy Hollow offers a variety of sweet treats and delicious snacks served throughout the day. 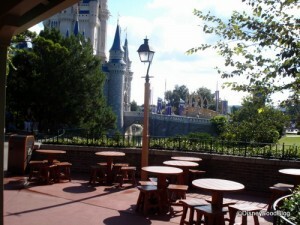 Seating is outdoors and overlooks the iconic Cinderella Castle. This location can provide a quiet respite in an otherwise bustling park. Famous funnel cakes can be powdered with sugar or cinnamon. For an added treat, splurge on the optional add-ons of strawberries and whipped cream for the ultimate funnel cake experience. So delicious that even the headless horseman could sniff them out! Funnel cakes, waffle sandwiches, ice cream cookie sandwiches, bagged chips, chocolate chunk cookies, soft serve ice cream, soup, soft drinks, fruit juices, water, a variety of specialty coffees, and hot drinks are available. This is a great spot for a family photo! If you don’t like fighting the crowd in front of the castle for the perfect picture, take one here; you’ll get the beautiful side profile of the castle, reflective water, and fewer guests popping into your frame. The menu changes from time to time, but this is one of the only spots in the Magic Kingdom where you can get a homemade ice cream sandwich. FYI: The Nutella Waffle Sandwich at Magic Kingdom Is Still Stupid Good.